AUCTION LOCATION: 1250 E. GREG ST. UNIT 1 SPARKS, NV. Haas 4th Axis 8” Rotary Table. Suburban 6” x 12” Compound Magnetic Sine Chuck. 2-4-6, 1-2-3 Blocks, V-Blocks, Angle Plates and Parallels. Insert Drills, Mills, Turning and Boring Tooling w/ Carbide Inserts. Huot Endmill, Tap and Drill Cabinets. Taper Shank Drills and Reamers, Endmills, Drills, Taps, Reamers and Perishable Tooling. Jones & Lamson 20” Optical Comparator s/n C-509009 w/ J & L Decimetric II DRO. Mitutoyo 20”-24”, 16”-20”, 12”-16” OD Mics. Phase-II 11”-12”, 10”-11”, 9”-10”, 8”-9”, 7”-8” 6”-7” OD Mics. Mitutoyo 8”-9”, 7”-8” OD Mics. NSK 0-6” OD Mic Sets. Sunnen CF-1126 Bore Gage Setting Fixture. Kanon 40”, 24”, 12” Vernier Calipers. 24” x 36” x 4 ¼” Granite Surface Plate w/ Stand. 1976 Chevrolet Scotsdale-20 4X4 Stake Bed Truck VIN# CKL246F491540. Crane-Veyor ½ Ton Cap. 6-Post Free Standing Gantry Crane w/ Electric Hoist, Approx 23’ x 42’ @ Posts. Gorbel ½ Ton Wall Mounted Jib w/ CM Electric Hoist. 1-Ton Cap Wall-Mounted Jib w/ Acco ½ Ton Electric Hoist. ½ Ton Wall Mounted Jib w/ Coffing Electric Hoist. ½ Ton Cap Wall Mounted Jib w/ Electric Hoist. Spanco ¼ Ton Cap Floor Mounted Jib w/ Electric Hoist. Spanco ¼ Ton Cap Floor Mounted Jib (NO HOIST). 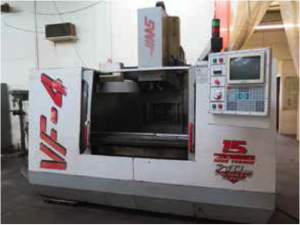 1996 Haas VF-4 4-Axis CNC Vertical Machining Center s/n 8017 w/ Haas Controls, 20-Station ATC, CAT-40 Taper Spindle, 7500 RPM, Thru Spindle Coolant, 15Hp High Torque Motor, Rigid Tapping, Programmable Coolant Nozzle, Floppy Disc, 18” x 52” Table, Coolant. Mori Seiki MV-50W CNC Vertical Machining Centers/n 3 w/ Fanuc System 6-M Controls, 32-Station ATC, CAT-50 Taper Spindle, 31” x 62” Table, Coolant. Mori Seiki MV-JUNIOR CNC Vertical Machining Center s/n 3273 w/ Yasnac Controls, 20-Station ATC, CAT-40 Taper Spindle, 17 ¾” x 35 ½” Table, Coolant. Hitachi Seiki VA-40 CNC Vertical Machining Center s/n NA w/ Fanuc Series 6-M Controls, 25-Station ATC, CAT-40 Taper Spindle, 15 ½” x 49” Table, Coolant.Webb mdl. 5BVK CNC Vertical Mill s/n 782087 w/ Webbmatic 800 controls, Fanuc Series 0-M Controls, NTMB-40 Taper Spindle, 75-3800 Dial Change RPM, 13” x 42” Table. 1997 Doosan Dooturn-4 CNC Turning Center s/n LND0092 w/ Fanuc Series 0-T Controls, 12-Station Turret, Hydraulic Tailstock, 15” 3-Jaw Power Chuck, 2-J Power Chuck, Chip Conveyor, Coolant. Daewoo PUMA 8HC CNC Turning Center s/n 560093 w/ Fanuc Series 0-T Controls, 12-Station Turret, Hydraulic Tailstock, 8” 3-Jaw Power Chuck, S-20 Collet Pad Nose, Chip Conveyor, Coolant. Star VNC-32 Twin Spindle – Twin Turret Multi-Axis CNC Screw Machine s/n 016102 w/ Fanuc Series 10-T Controls, (2) 6-Station Live Turrets, Live Turret Tooling, Hydraulic Bar Feed, Coolant. Zhen Jiang mdl. CZ6280 32” x 156” Geared Head Gap Bed Lathe s/n 96104 w/ 16-900 RPM, 1000mm Swing Over Gap, 4000mm Between Centers, Inch/mm Threading, Tailstock, 10” 4-Jaw Tailstock Chuck, Steady and Follow Rests, KDK Tool Post, 31 ½” 4-Jaw and 20” 4-Jaw Chucks, 31 ½” Faceplate. Sharp mdl. 2680 26” x 80” Geared Head Gap Bed Lathe s/n 6712009 w/ 15-1000 RPM, Inch/mm Threading, Taper Attachment, Tailstock, Steady Rest, KDK Tool Post, 18” 4-Jaw and 16” 4-Jaw Chucks. Hardinge mdl. HC Hand Chucker s/n HC-6832-T w/ 125-3000 RPM, 8-Station Turret, Power Feeds, 5C Collet Closer, Cut-Off Attachment and Tooling. Amada HA-400 16” Automatic Hydraulic Horizontal Band Saw s/n 40300059 w/ Amada Controls, Auto Clamping and Feeds, Bundling, Chip Auger, Coolant, Conveyors. Wells mdl. 1270 12” Horizontal Band Saw s/n 1775 w/ Manual Clamping, Coolant, Conveyor. Davis No.5 Mechanical Broaching Machine. LeRoi mdl. 25SST 25Hp Rotary Screw Air Compressor w/ 120 Gallon Tank. Wayne 10Hp Horizontal Air Compressor w/ 120 Gallon Tank. Acco Press 70-Ton Sliding Ram Hydraulic H-Frame Press. Custom Hydraulic H-Frame Press w/ Enerpak Electric/Hydraulic Power Unit. Rotary Parts Washer w/ 29” Basket. No.5 Arbor Press w/ Stand. Universal Dry Blast Cabinet w/ Dust Collector. Esab Heliarc 352 AC/DC Heliarc Welder s/n TA-1624057 w/ Esab WC-8C Coolant Circulator. Miller CP-200 CP-DC Arc Welding Power Source s/n 72-636973. TeroDyn Metal Sprayer w/ Gages and Acces. Airflow Systems Portable Fume Collector. MicroAir mdl. MA4100 Portable Fume Collector. MicroAir Ceiling Mounted Fume Collectors. Union BF-80 Horizontal Boring Mill s/n 21031/61 w/ Newall DRO, 2.8-1000 RPM, Power Feeds, 19” Boring Spindle Chuck, 35 ¾” x 44 ½” Indexing Table @ 1 Deg, Arbor Tailstock, Arbors. MaxMIll mdl. YC-2G Mark-II Universal Power Mill s/n 03498 w/ NTMB-40 Vertical and Horizontal Spindles, 75-3600 Vertical RPM, 85-1300 Horizontal RPM, Power Feeds, 11” x 51” Table.